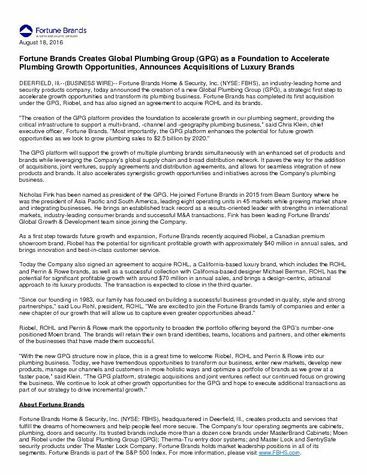 DEERFIELD, Ill.--(BUSINESS WIRE)-- Fortune Brands Home & Security, Inc. (NYSE: FBHS), an industry-leading home and security products company, today announced the creation of a new Global Plumbing Group (GPG), a strategic first step to accelerate growth opportunities and transform its plumbing business. 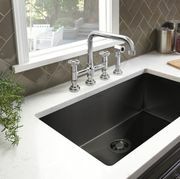 Fortune Brands has completed its first acquisition under the GPG, Riobel, and has also signed an agreement to acquire ROHL and its brands. "The creation of the GPG platform provides the foundation to accelerate growth in our plumbing segment, providing the critical infrastructure to support a multi-brand, -channel and -geography plumbing business," said Chris Klein, chief executive officer, Fortune Brands. "Most importantly, the GPG platform enhances the potential for future growth opportunities as we look to grow plumbing sales to $2.5 billion by 2020." The GPG platform will support the growth of multiple plumbing brands simultaneously with an enhanced set of products and brands while leveraging the Company's global supply chain and broad distribution network. It paves the way for the addition of acquisitions, joint ventures, supply agreements and distribution agreements, and allows for seamless integration of new products and brands. It also accelerates synergistic growth opportunities and initiatives across the Company's plumbing business. Nicholas Fink has been named as president of the GPG. 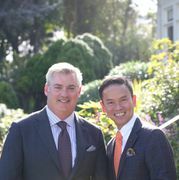 He joined Fortune Brands in 2015 from Beam Suntory where he was the president of Asia Pacific and South America, leading eight operating units in 45 markets while growing market share and integrating businesses. He brings an established track record as a results-oriented leader with strengths in international markets, industry-leading consumer brands and successful M&A transactions. Fink has been leading Fortune Brands' Global Growth & Development team since joining the Company. As a first step towards future growth and expansion, Fortune Brands recently acquired Riobel, a Canadian premium showroom brand. Riobel has the potential for significant profitable growth with approximately $40 million in annual sales, and brings innovation and best-in-class customer service. Today the Company also signed an agreement to acquire ROHL, a California-based luxury brand, which includes the ROHL and Perrin & Rowe brands, as well as a successful collection with California-based designer Michael Berman. ROHL has the potential for significant profitable growth with around $70 million in annual sales, and brings a design-centric, artisanal approach to its luxury products. The transaction is expected to close in the third quarter. "Since our founding in 1983, our family has focused on building a successful business grounded in quality, style and strong partnerships," said Lou Rohl, president, ROHL. "We are excited to join the Fortune Brands family of companies and enter a new chapter of our growth that will allow us to capture even greater opportunities ahead." Riobel, ROHL and Perrin & Rowe mark the opportunity to broaden the portfolio offering beyond the GPG's number-one positioned Moen brand. The brands will retain their own brand identities, teams, locations and partners, and other elements of the businesses that have made them successful. "With the new GPG structure now in place, this is a great time to welcome Riobel, ROHL and Perrin & Rowe into our plumbing business. Today, we have tremendous opportunities to transform our business, enter new markets, develop new products, manage our channels and customers in more holistic ways and optimize a portfolio of brands as we grow at a faster pace," said Klein. "The GPG platform, strategic acquisitions and joint ventures reflect our continued focus on growing the business. We continue to look at other growth opportunities for the GPG and hope to execute additional transactions as part of our strategy to drive incremental growth." Fortune Brands Home & Security, Inc. (NYSE: FBHS), headquartered in Deerfield, Ill., creates products and services that fulfill the dreams of homeowners and help people feel more secure. The Company's four operating segments are cabinets, plumbing, doors and security. Its trusted brands include more than a dozen core brands under MasterBrand Cabinets; Moen and Riobel under the Global Plumbing Group (GPG); Therma-Tru entry door systems; and Master Lock and SentrySafe security products under The Master Lock Company. Fortune Brands holds market leadership positions in all of its segments. Fortune Brands is part of the S&P 500 Index. For more information, please visit www.FBHS.com. This press release contains certain "forward-looking statements" regarding business strategies, market potential, future financial performance and other matters. Statements preceded by, followed by or that otherwise include the words "believes," "potential" "expects," "anticipates," "intends," "projected," "estimates," "plans," "outlook," and similar expressions or future or conditional verbs such as "will," "should," "would," "may," "look to" and "could" are generally forward-looking in nature and not historical facts. Where, in any forward-looking statement, we express an expectation or belief as to future results or events, such expectation or belief is based on the current plans and expectations of our management. Although we believe that these statements are based on reasonable assumptions, they are subject to numerous factors, risks and uncertainties that could cause actual outcomes and results to be materially different from those indicated in such statements. These factors are discussed in Item 1A of our Annual Report on Form 10-K for the year ended December 31, 2015, filed with the Securities and Exchange Commission. In addition, this press release contains certain forward-looking statements that involve risks and uncertainties associated with the transaction between Fortune Brands Home & Security, Inc. ("FBHS") and ROHL, LLC ("ROHL"). These risks and uncertainties include: the satisfaction of closing conditions for the transaction between FBHS and ROHL; market conditions; the impact of any failure to complete the transaction; the risk that FBHS will not realize the anticipated benefits of the transaction; and other factors beyond the companies' control. The forward-looking statements included in this release are made as of the date hereof, and except as required by law, we undertake no obligation to update, amend or clarify any forward-looking statements to reflect events, new information or circumstances occurring after the date hereof.